If you are looking for information on the IM=X Pilates franchise business opportunity, IMX Pilates franchises or IM=X Pilates Studio franchising, then you have come to the right place. The IM=X Pilates Studio Franchise is the most innovative, personalized fitness system that capitalizes on the high demand for pilates exercise and back wellness. Become an IM=X Pilates Studio owner and benefit from our 10 years of history in the pilates and exercise business. The IM=X Pilates Studio franchise is a turnkey business. Whether you are an instructor, personal trainer, business owner or fitness enthusiast, you can own one or several successful IM=X pilates studios! Our goal is for you to capitalize on the success of the IM=X pilates program and equipment! "...the trendiest class on the coast ...IM=X -- a muscle toning and flexibilty program leads exercisers through a series of toning and stretching moves on a sturdier version of the pilates reformer... You'll gladly groan through the 30-60 minutes of body shaping." "IM=X Pilates has been training Pilates instructors for 8 years and now offers studio franchises...Pilates [is] now one of the fastest growing fitness trends in the nation..."
IM=X stands for Integrated Movement Xercize. It's an elite fitness program that marries the muscle toning and lengthening benefits of pilates with elements of strength and cardio training to increase flexibility, endurance and muscle tone, while strengthening the spine and abdominal core. IM=X is a cross-conditioning system that includes pilates moves but adds resistance training and plyometric jumps for a more athletically oriented workout. IM=X pilates programs can be targeted to specific populations (i.e. athletes, seniors, back pain, pregnancy...); or tailored for a specific focus (i.e. Lower Body Workout, Interval Training Workout, Stretch Workout, Basics, Upper Body Workout and more...) The variation within IM=X makes it possible to address everyone from the "couch potato" to the professional athlete. IM=X certifications and programs update the original pilates (developed 70 years ago) to reflect the changes in exercise science. For this reason, IM=X has been described as "next evolution of Pilates." 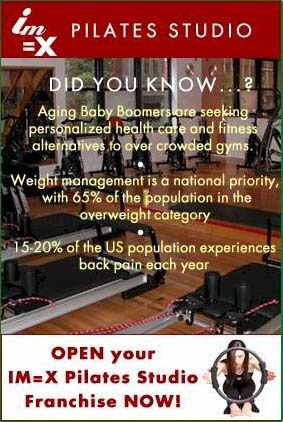 Benefit from our proven exercise programs and business methods. Become your own boss! As an experienced fitness professional or business owner you have the opportunity to capitalize on your hard work and knowledge. Our Operations Manual and Business Training Course prepare you to develop, manage and operate your own studio or studio chain! Your staff will learn a variety of programs in our certification courses (i.e. low back, stretch, pre/postnatal, lower body, cardio, interval). Every year we will train and certify up your staff in both the Basic, Advanced and Spinal Xercize programs -- an annual value of $20,000. As a franchise you benefit from our commitment to making your instructors/personal trainers the best in the industry! Offer your customers an elite workout on the strongest pilates machine -- the Xercizer. Our patented Xercizer is built for all body types, from the professional football player to the petite dancer.